I bought an ice cream recipe book (this one) a couple of months ago and Bryn and I have been bookmarking recipes and slowly working our way through them. This week we made the apple and cinnamon flavor since it seemed autumny enough. 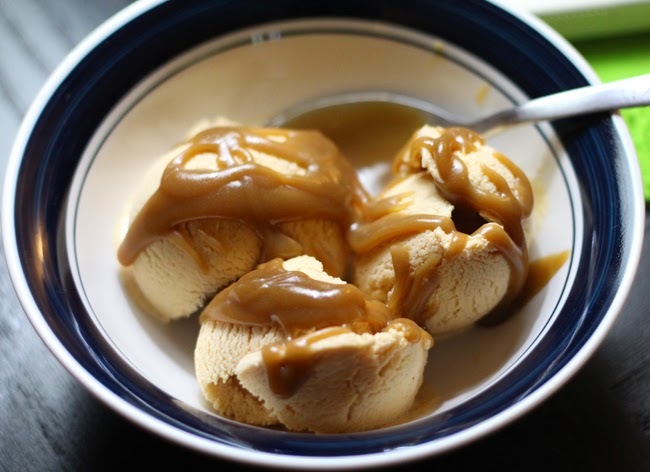 I decided to whip up some salted butterscotch sauce to pour over it, making it more of a caramel apple ice cream - definitely an autumn flavor! Start by warming the whole milk and cinnamon sticks until it's almost boiling. Turn off the heat, pop a lid on it and let it steep for 20 minutes or so. In a bowl whisk together the egg yolks and caster sugar. Now take the cinnamon sticks out of your milk and pour some into the egg mixture, stirring it the whole time. Pour your now warm eggs into the pot with the rest of the milk, and heat this, stirring all the time until you have a custard that coats the back of a wooden spoon. Strain your custard into a big bowl and let it cool completely. In the meantime, peel and dice your apples then toss them in the ground cinnamon. Melt the butter in a pan and gently cook the apples until they are nice and soft (We decided we didn't cook ours long enough and the final product had crunchy bits of apple in it. If you like that, then by all means just cook them a bit, but next time we're going to cook ours to death!) Set the apples aside to cool. Once the custard is cool, pour in the whipping cream and vanilla and stir it all up. You may want to seive it again before putting it in your ice cream machine. Follow your machine's instructions from there! When the ice cream is almost the consistency of soft serve, add the cooled apples and let it finish churning. Move it to a container and pop it in the freezer to set. Now make the butterscotch sauce. I used Smitten Kitchen's recipe and it is rather naughty and a bit dangerous according to Bryn, so just hop over to the website and check it out! Pour your butterscotch sauce over your cinnamon apple ice cream and all the sudden it's just like you're eating a caramel apple and it's delicious!! I especially recommend it if you live in a place where seasons don't exist and you are really missing fall. Oh my, this looks... heavenly!